Shavuot is the giving of the Torah that stretched out over millennia. What actually was given to us at the Mount Sinai? Why do we all the time return to it? How long can we receive the Torah? The nation of Israel is forged in the Sinai furnace. Lightings were flashing above the very top in the black cloud, thunder rumbled and we were looking out of the camp in fear. The crack of doom was heard everywhere. The mountain was emitting smoke and shuddering when we came to its foot. And Moses went to the top at the call of the Creator. Or maybe the Torah describes not this Hollywood picture but something much more serious? The thing that is happening within us today. Maybe the cloud fell on the heart? Maybe it was mountain of hatred, hanging over us in smoke and fire? Maybe passions were thundering and burning within us, making us to shudder to the depth of our nature? The Torah isn’t a chronicle about past events; on the contrary, it describes the moment when our future is being decided. For the first time a clear answer is required from all of us: Are we ready to accept the mutual guarantee as a law of life? After all, exactly this is the Torah—an instruction on how to become guarantors for each other. Since then the main lesson is passed from generation to generation: The Torah that was given to us once, we need to receive it again and again. We must receive it at the mountain of hatred (Sina), under the roar of storm raging inside. Accepting this Law we were living together on our land, rejecting it we dispersed among other nations. The surprising fact in the modern era is that the land of Israel “given” to us, like the Torah, also waits for us to receive it. Since the proclamation of independence almost 70 years have passed. Half a century ago we united Jerusalem. However, this isn’t yet the guarantee, not the nation united “as one man with one heart.” Yes, physically we have “left Egypt,” returned home, but internally we haven’t yet passed through Sinai and therefore we risk losing our chance. The modern state of Israel is a historical window of opportunities. And most importantly, it is open not only for us, but for the whole world. After all, today the entire humanity turns into a powder keg of passions. And our choice will be decisive for it. Shavuot, like all Jewish holidays carries a call for action. It is bright, it is full of whiteness, but it isn’t simple. If it was enough just to hold hands and smile to each other for a second, we would’ve built here a “garden city” long time ago for everyone to admire. However, it’s not so. We were given the land and the opportunity to live on it like brothers, and we instead hesitate, squabble, drink each other’s blood and try somehow to solve problems as they come. Fate presented us with the unique chance for unity, and we even don’t understand what is happening. We bump into each other, people are strangled by indifference, burned with anger, and deafened by cannonade of sectoral enmity, but we pretend that everything is fine, nothing wrong. We can continue living like this. We have such an experience of disasters behind of us that seemingly we can’t complain. However, this is just a respite! In fact, we are slowly but surely getting pressed to the mountain of our own hatred. We are not looking out of the camp, but this mountain nevertheless is hanging over us right now. Naturally, when we don’t notice it we don’t need the Torah. Lightning sparkles somewhere, from somewhere we feel heat, heart sometimes rumbles “under the bonnet”, but we are on our land, and not in some desert. Right? No, we are where our hearts are. We are in the desert of barren and soulless relationships. If we suddenly discover how egoism tears us to pieces, if we try to connect into something integral and face an insuperable internal split then we need help. It turns out that the «normal» exit from Egypt is not the end. The main challenge is ahead of us. All the ways lead to the mountain. At the foot of it, having finally realized the problem and recognized the disease we understand and take the medicine. It was in this “pharmacy” before, but we didn’t know that we are sick. This is why the giving of the Torah and its reception is not the same thing. The Torah is a medicine intended solely for «internal use,” for the connection between us. All our troubles, exiles, destructions of the Temples, wandering and persecutions were caused by the unfounded hatred that made us distant strangers to each other. Everything that divides us directly or under the cover of beautiful and correct words is a deadly poison. It eats away everyone. If we raise our eyes from everyday worries, we will see how far we are scattered from each other. We are not just separated, we enjoy pricking, humiliating, and trampling. Each one wants to be more successful, richer, smarter, and higher than others. This is especially evident in the media, where the vices of society are visible as on the palm of a hand. No one is surprised at anything anymore and nobody is ashamed. Now we have the opportunity to receive help, an instruction, a force that will bring us together, so that we will build healthy relations in the society and live happily in our country. This is the current moment of evolutionary development: either we will grow up ourselves and start using the Torah according to its purpose, for the sake of unity above all disagreements, or the adversity of growing up will force us to do this. In essence, this it the situation in which any child finds himself as soon as he stops being an infant. The best thing we can do for ourselves and for the world is to unite at the mountain of hatred, the mountain of our doubts and reveal Moses within ourselves, the power that pulls (Mosheh) us upward. It always works if we are together. Then we will understand that not some refugees from Ancient Egypt camped in the desert in order to receive the most important gift in life, but each of us, no matter where he lives, to which nationality belongs, and which religion professes, stands at the foot of the mountain. Here is only one nationality—human, and the heart is one for all. The Torah, indeed, is the most powerful tool that we still don’t know how to use. A person can’t reach it alone, and we are not ready to do it together. It will provide us with security and prosperity and will give peace to the world. We just need to get used to the fact that it works not in one separate person, but between us. After all, egoism is revealed exactly in relation to others. Once it burst out in Babylon and since then it always manifests in the society, in the relationship between people. Therefore, the Torah is aimed to correct connection of the person with the environment at any time and at any level of technical development. It can’t be replaced with the newest means of communication. Everything we have won’t work correctly without it. Only a positive relationship will allow us to lay the solid foundation of our future. Torah, Deuteronomy 23:07: You shall not ever seek out their welfare or their good, all your days. Egoistic desires, called “Ammonites or Moabites,” reveal on each level of the ladder we ascend. And each time they are new and more powerful . All the 125 levels are similar to each other; they only differ in power and volume of positive and negative properties, properties of the right and the left line, and the number of details involved. In principle, the power of the level depends on the number of desires and intentions. When we ascend, our state becomes very integrated and complex, and it is in this complexity, comprising all of its pluses, minuses, all the power of our connection, we find perfection. It is from the closure of millions of various kinds of forces, intentions, and acts—from the beginning of creation, the middle, and again from the beginning, from the end, etc.—that the perfection of the Creator is attained. Full disclosure of the mechanics of the Creator’s interaction with the desire that He created is the supreme delight of the soul. About this it is said that “The righteous sit and enjoy the radiance of the Shechina.” After all , the upper Light of wisdom fills the entire creation, shimmers and shines. This attainment comprises the highest meaning and supreme delight the soul feels. Question: We are living in a very difficult but meaningful period. How can a person who aspires for the Creator look calmly at how the herd is destroyed? After all, he values it, pities it, although he himself becomes part of it. Is the only way to seriously influence the absurd is for a seed to fall on the ground when it is young so that it can sprout? Answer: No one does anything independently. It is the upper force that performs everything in order to bring a person to the recognition of the truth and to get closer to it. Question: Why do people torture each other and behave violently to animals? Why does the Creator allow such behavior? What is the root of this behavior and what solution do you see to this problem as a Kabbalist? Answer: The entire correction of the world comes down to the correction of man alone, through integral education. Nothing is more valuable than the Torah. Why then have we forgotten that the Torah has nothing to do with meaningless words in printed books, and everything to do with unity? 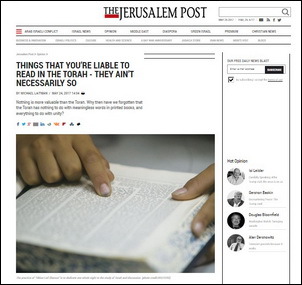 “It ain’t necessarily so,” sang Sportin’ Life in the opera Porgy and Bess, and added, “The things that you’re liable to read in the Bible—it ain’t necessarily so.” This coming Tuesday, we will celebrate Shavuot, the festival of the granting of the Torah. The majority of non-observant Jews know that the festival includes a meal with plenty of sweet dairy foods. The majority of Jews also know that on this day, way back in time, the Torah was given to the people of Israel. Yet, very few people know what the Torah really is. As a result, very few understand why we celebrate receiving it. 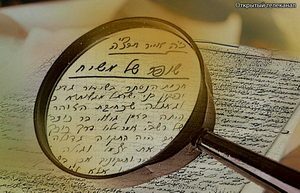 Contrary to what most of us have been taught, the Torah is not a set of rules we must observe in order to appease a fearsome God, nor is it a collection of tales that may or may not have happened. As we will see below, nothing is more pertinent to our lives than the Torah. Nothing can bring us greater benefit than knowing what the Torah is, what it is for, and how we can use it. When we understand this, we will see that Shavuot is not merely a festival, but an extremely important point in our quest for happiness. In Masechet Shabbat (31a), the Talmud writes that when a convert asked about the meaning of the Torah, Old Hillel told him unambiguously: “That which you hate, do not do unto your friend; this is the whole of the Torah.” Likewise, Rabbi Akiva—whose disciples composed both The Book of Zohar and the Mishnah—said, “Love your neighbor as yourself is the great rule of the Torah” (Jerusalem Talmud, Nedarim, Chapter 9, p 30b). The Babylonian Talmud (Kiddushin 30b) writes that the Creator said, “My sons, I have created the evil inclination, and I have created for it the Torah as a spice.” Similarly, the book Metzudat David (Commentary on Jeremiah, 9:12) explains that Israel lost their land because they fell into the evil inclination once they stopped engaging in the Torah because “the light in it reforms it.” And just so we do not misunderstand the meaning of “evil inclination,” the Holy Shlah writes (In Ten Utterances, “Utterance no. 6”), “The most evil qualities are envy, hatred, greed, and lust, which are the qualities of the evil inclination,” precisely the attributes that constitute our ego. When we, the people of Israel, succumbed to the evil inclination and fell into unfounded hatred, we lost far more than the Temple. We lost our ability to use the Torah, the reforming power, in order to rise above our egos. Instead of light, we were left with words whose connection to love of others, mutual responsibility, and unity became hidden from us. In losing that connection, we lost everything that defines Judaism and the people of Israel. Our ancestors received the reforming light and became a nation only after they pledged to unite “as one man with one heart.” Now, we too must begin to nurture our unity. Precisely because our unfounded hatred is still so profound, we must not wait. Any further delay can cost us heavily in human lives and torments as our world will soon become too immersed in hatred and suspicion to turn back. The book Likutey Halachot (Assorted Rules) also explains the connection between the Torah and Israel’s unity. In the chapter Hilchot Arev (“Rules of Guarantee”), the book writes, “The root of mutual responsibility extends primarily from the reception of the Torah, when all of Israel were responsible for one another. This is so because at the root, the souls of Israel are regarded as one, for they derive from the origin of the unity. For this reason, all of Israel were responsible for one another upon the reception of the Torah,” namely the reception of the reforming light. Today, in the turbulent reality that is our lives, engaging in Torah—meaning nurturing our unity—is not only our key to success; it is the key to our survival as individuals, as Jews, and as a sovereign nation. We must not rely on foreign rulers and the trumpets they sound. Our weapon is unique and cannot be taken away. It hurts no one, but it makes us indestructible. Our weapon is the power of our unity, and the festival of the giving of the Torah is approaching at the perfect time to remind us that now we must use our secret power—the reforming light—that abides in our unity, which is our law, our Torah. Question: Social engineer and futurist Jacque Fresco is implementing the Venus Project aimed at establishing a peaceful global civilization based on an economy focused on shared ownership of resources. Is life without money possible from a Kabbalistic perspective? Answer: Life on earth can be based on absolute communism in the positive sense of the word. Baal HaSulam describes such a society in “The Last Generation.” When it will be established is up to us.